1. 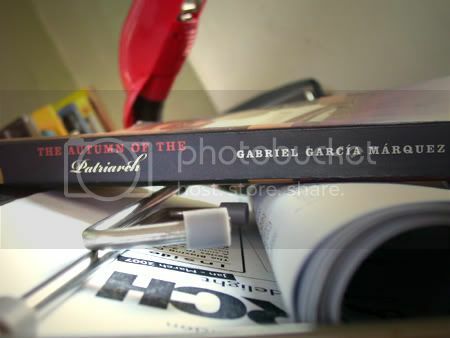 The Autumn of the Patriarch by Gabriel Garcia Marquez. It's a complicated piece: sentences run wild, spanning pages upon pages, and quotation marks are never used, general sir. Arguably one of Marquez's most ambitious works, it reveals how absolute power can corrupt absolutely. Thanks for the book, Dianne! 2. 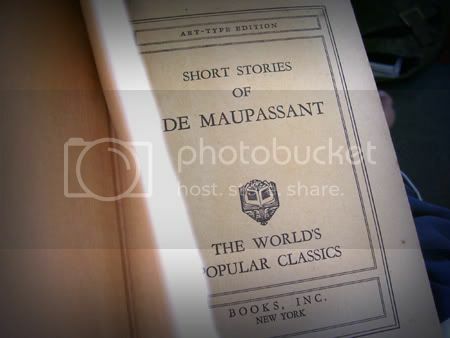 Short Stories of Guy De Maupassant. The copy Kuya John lent me is so old you can tear the pages by blowing. I'm still working my way through it. The best story I've read so far remains to be The Necklace. Everytime I read it I feel the urge to tell Madame Loisel: check your diamond if it scores high in the Mohs Hardness Scale! 3. Love in the Time of Cholera by Gabriel Garcia Marquez. When I asked Dianne to lend me her copy (she has a great book collection, mind you), she immediately warned me that it's a love story, knowing fully well my epileptic tendencies when it comes to matters of the heart. I told her, don't worry, Dianne, if it's a Marquez love story I really don't care. Oh, I love Guy de Maupassant. In fourth grade I almost cried after reading Maitre Hauchecorne's tragic end in "The Piece of String." It's there in the compilation, is it? i don't have the god of small things, but i have a friend who does. si ate joan. i think the book is hers. i take this comment to mean na pahihiramin mo ako ng mga books na yan, hehehe. thanks glenda!